"Cristy stood out to us as a top candidate for our internship because of her experience managing Carnegie’s Dogapalooza over the past several years. Her experiences with this event are in line with a lot of the programs and events Cristy manages as our intern this summer, so we knew she would be able to handle the work load and execution. Cristy’s experiences at Point Park have built a solid foundation and understanding of the industry from which to build upon. 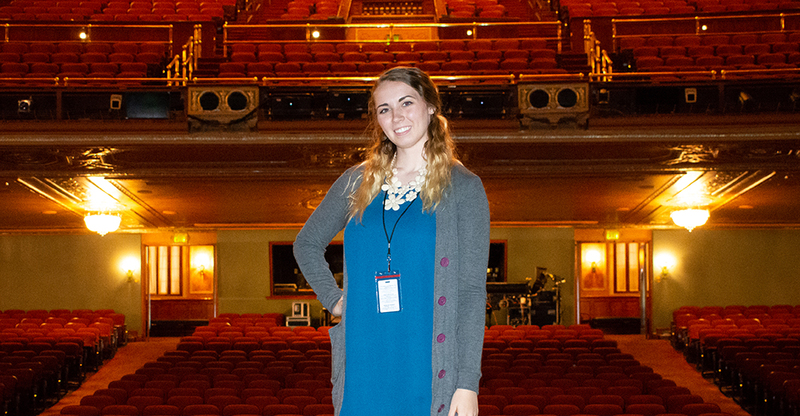 Her experience and knowledge of the arts allowed her to hit the ground running on day one." "I transferred to Point Park University because of the thousands of opportunities that are available being in Downtown Pittsburgh and for the sports, arts and entertainment management program. No other university has this program and since it is the field I would like to work in, this is the exact major that will give me the proper education I need to succeed." Why did you decide to transfer to Point Park University? I transferred to Point Park University because of the thousands of opportunities that are available being in Downtown Pittsburgh and for the sports, arts and entertainment management program. No other university has this program and since it is the field I would like to work in, this is the exact major that will give me the proper education I need to succeed. How did you land your summer internship with the Pittsburgh CLO? I landed this summer internship through a series of applications and interviews. Being a season subscriber, I have known about the summer internships for a long time, and it was a huge goal of mine (professional and personal) to intern at the Pittsburgh CLO. Tell us about the work you do there and how your SAEM classes have helped you. I am responsible for managing the "A" in Arts and Kelly Circle programs that give away free tickets. Also, I help to take care of donor benefits and a lot of customer needs, working in depth with Tessitura and Microsoft Office Suites. I have the sole responsibility of creating and running the annual summer Donor Dress rehearsal and reception. My SAEM classes have helped a tremendous amount right from the beginning — from interview techniques to professionally building relationships with customers and donors in the workforce. What plans do you have for your upcoming junior year? I have a LOT planned for the upcoming year including trips to Disney for a business leadership conference and to Orlando for the Performing Arts Exchange (all through the Rowland School of Business). I will be competing on Point Park's Dance Team for the second year. Also, I will continue teaching dance, working as a promotions assistant for Entercom's Pittsburgh radio stations and coordinating the Fifth Annual Carnegie Dogapalooza. I want to work with a theater or dance company for a while and then eventually move on to possibly owning my own dance studio on the side. I also have been considering event planning as this will be my fifth year hosting Carnegie Dogapalooza. I started this event during my junior year of high school for a Girl Scout Gold Award. My advice is to just try things, go for it! The worst that can happen is someone telling you no. Then you go and try again!